Atlanta Blogger: HOORAY!!! Joe Johnson is OUT Of Atlanta. I’m starting to like Atlanta Hawks new GM Danny Ferry already. I’m hearing the Atlanta Hawks are getting five players and a first round pick in 2013 for Joe Johnson. This is great news because it frees up money for the Hawks in the future to do bigger and better things. 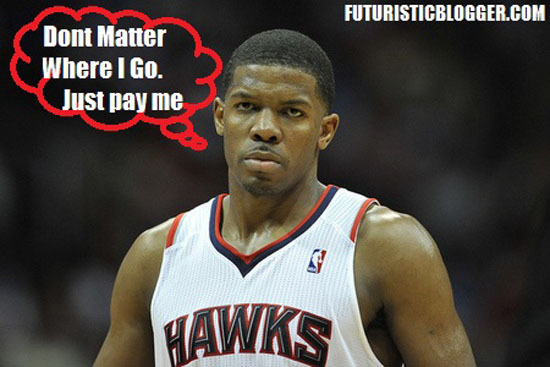 Joe Johnson was never worth $120 million. He never wanted to be in Atlanta, and he never played like he wanted a championship. I never seen Joe Johnson Dive for a loose ball, meaning I never seen Joe play with a sense of urgency. This was a great move for the Atlanta Hawks to start moving in the right direction. And that’s getting out of the 2ND round of the playoffs. — GO HAWKS!! Complete and utter moron. The hawks let the nets steal Joe Johnson. The hawks got 5 horrible players, 3 or 4 probably won’t even be on the team soon and a lottery protected pick, meaning it won’t be any higher than 15. If you thought it was hard for the hawks to get out the second round with Joe Johnson they probably won’t make it to the playoffs for tor the next 7 or 8 years. I’d rather my team be broke and with talent than rich and without.